In today’s Sunday school lesson, Gregory learned about how Abram gave away the spoils of war to the King of Sodom. He couldn’t help imagining how it all might have happened. 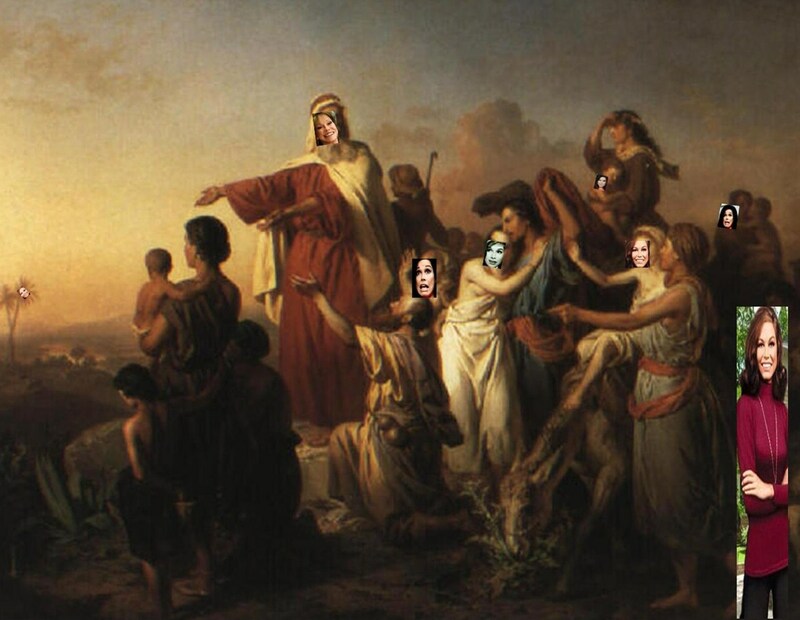 Then everybody went back to Abram’s place and they held a big celebration with the King of Sodom and the King of Salem. The king of Salem later went on to have a cigarette named after him and, it is rumored, that the King of Sodom later went on to have a camel named after him. The King of Salem was also a priest of The God Most High, so when everyone had finished feasting on goat hotcakes and were sitting around smoking Salem’s cigarettes, they all started yelling “Speech! Speech!” because in biblical days listening to speeches was on everybody’s bucket list, even God’s. Mel: No I was gonna say some bread and wine. Abram: Does the bread at least come with syrup? Abram: Now wait a minute here, Mel. After going to war and defeating five kings for you and your wives and your slaves and managing to save every one of your asses, this is the thanks I get from The God Most High? Mel: Apparently. But let me double-check my Excel Spread Stone. Let’s see . . . yup It says the standard reward for defeating five kings is Bread and Wine. The standard reward for defeating four kings is Goat Hotcakes. Abram: I’ll take a downgrade then. Mel: You can’t take a downgrade! Nobody ever takes a downgrade! Abram: Yeah, well I’m Abram, and I’m best friends with the Manager, The God Most High. Mel: Well why didn’t you say so in the first place? Just let me run it by my supervisor first. Mel: The God Most Medium. Mel walks to a corner of the tent, closes his eyes for a few minutes and then returns. Abram: So what’d he say? Mel: He said he can pull some strings and downgrade you to Goat Hotcakes but only if you give away ten percent of the loot you collected from the spoils battle. Then the King of Sodom took the floor. King of Sodom: Look, Abram, you don’t have to give me anything. I just want all my people back. I love my people . . . maybe a little too much, but still! King of Sodom: What about buttons? Abram: . . . and therefore, King of Sodom, you can never say, ‘I am the one who made Abram rich’ because I will take nothing for myself. And furthermore, I will accept only what my men have used. King of Sodom: Well okay, suit yourself. So I guess the only thing left to do now is load up the spoils of war onto the The King of Sodom’s back. Abram: I don’t believe my ears! You mean, you, the King of Sodom, will be carrying the spoils of war on your back? King of Sodom: No silly! I was talking about King of Sodom, my camel. And a good laugh was had by all. And there you have it, Dear Readers. Please check back next week at this time to find out what Gregory learns about the bible next. Today’s Sunday school lesson will be a pop quiz. HA! Which fruit was forbidden in the Garden of Eden? Please put down your pencils down. If you answered”a” to all of the above questions, congratulations! You have just turned the world on with your smile! I’m afraid the rest of you will have to stay after class until you find all 8 biblical Mary Tyler Moore’s in the picture below. 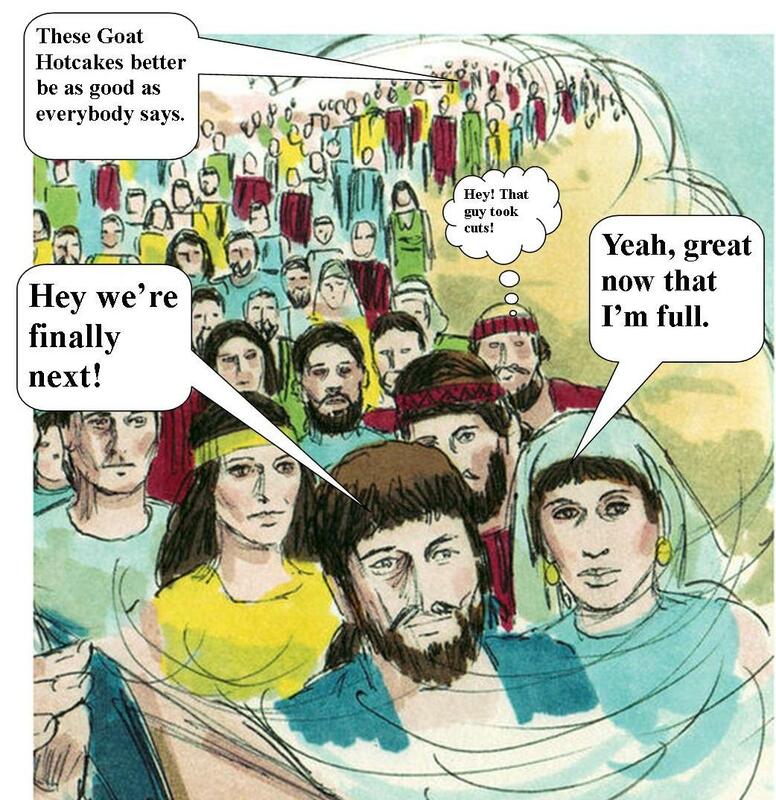 Gregory’s Bible Stories: 318 Goat Hotcakes to Go! Welcome, Dear Readers, to this week’s edition of Gregory’s Bible Stories. This week Gregory learned about how Abram took 318 fighting men to rescue his nephew, Lot, who had been captured by five kings. Gregory couldn’t help imagining how it all might have happened. 318 Goat Hotcakes to Go! In last week’s lesson, we learned that Abram’s nephew and business partner, Lot, had opened up a branch office of “Just Goats!” in beautiful downtown Sodom. One day, on his way to the bank to deposit two pieces of silver, four camels, three bags of grain, and get a roll of chickens so he could make change, Lot heard news that four kings with unpronounceable names from unpronounceable places had gone to war with five kings whose names were even more unpronounceable than the four kings with unpronounceable names and the places they were from were so unpronounceable, everybody just said ‘oh the hell with it’ and ordered more goat hotcakes. Occasionally between bites someone would shout “Go Ashteroth Karnaim, the Zuzim from Ham!” or we’ve got your back “Emim in the plain of Kirithaiaim!” But mostly people just ignored the Ongoing Unpronounceable Name King Conflict preferring to eat goat hotcakes dripping in goat syrup with plenty of ox butter. That is, until the day five Kings with unpronounceable names rang Lots’ tent bell. Five Kings: It’s five kings with unpronounceable names. We just defeated the King of Sodom and now we are here to take you and all your possessions! Lot: There’s a King of Sodom? Lot: How did you defeat him? Five Kings: It was easy. He ran away and fell in a tar pit. Lot: You mean he died? Five Kings: No but he’ll be scrubbing up for the rest of his life. Now get your stuff we’re taking you and all your possession with us. Five Kings: What difference does it make, you wouldn’t be able to pronounce it anyway. When Abram heard that his nephew had been captured by five kings with unpronounceable names, he would have cursed them, but he had kind of a speech impediment to begin with, and he just didn’t have the time nor the inclination. Abram: Fighting men! Come hither! Let’s see . . . one . . two . . . three . . . four . . . five . . . six . . . seven . . . eight . . . nine . . .
Random Fighting Man: Whatcha doin’ Abram? Abram: Six . . . seven . . .wait no! Nine . . .
Another Random Fight man: Abram? What are you doing? Abram: Seven . . . dammit! I’m counting, idiots! Yet another Random Fighting Man: Can’t you sleep? Abram and 318 give or take 12,000 (they just wouldn’t hold still) Fighting Men went to defeat the Kings that captured his nephew Lot. Abram and his fighting men pursued the five kings all the way to Dan. (Who was asleep by the side of the road). Random Fighting man: Excuse me, Abram? Random Fight Man: Uh, I think you’ve divided us unevenly into fighting groups. Aren’t you going to count us? Abram: Oh shut up and fight. Random Fighting Man: Gosh I could sure go for some goat hotcakes right now. Another Random Fight Man: Me two! Yet Another Random Fighting Man: Me three! Abram: I’m killing the next guy that counts. 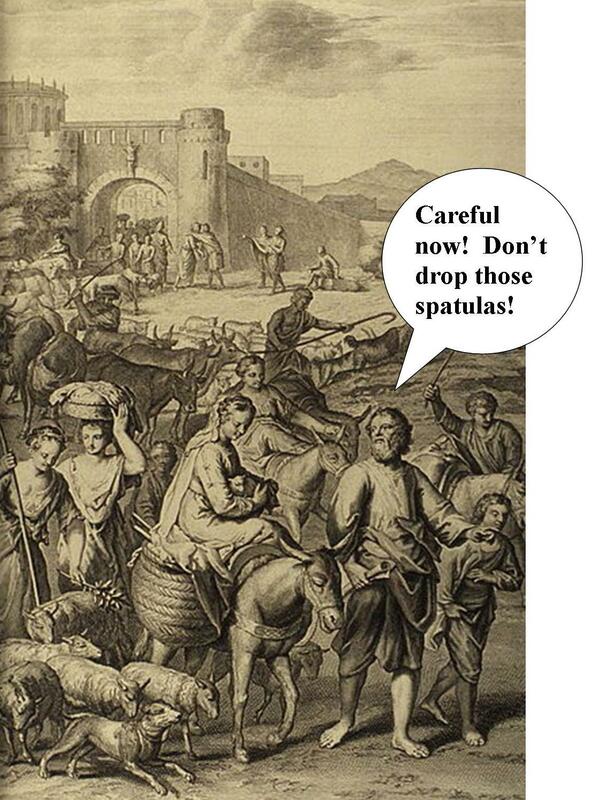 Then Abram brought back his nephew, Lot, all of Lot’s possessions, including Lot’s goat-hotcake-batter recipe, all of Lot’s animals, and even all of Lots cooking utensils right down to the spatulas and the women. Then everybody drowned their sorrows in plenty of goat hotcakes, smothered in goat syrup with plenty of ox butter and a good time was being had by all! And there you have it, Dear Readers! 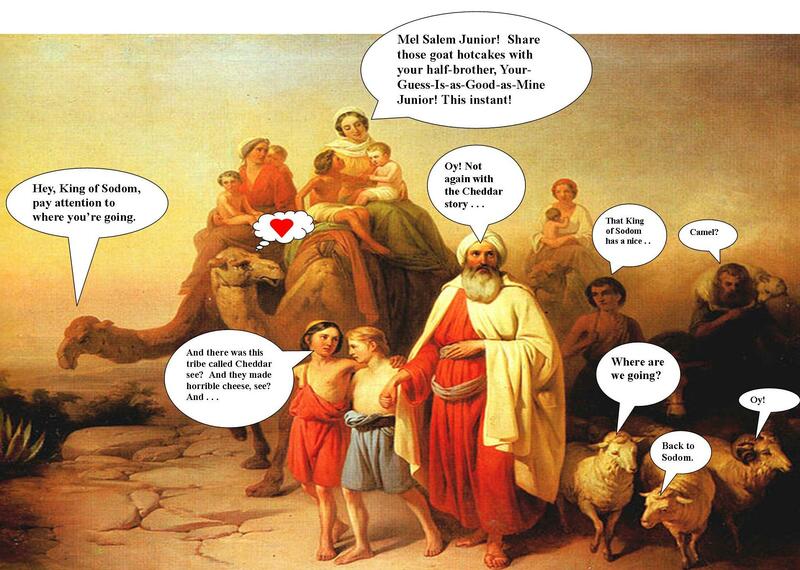 What Gregory learned in Sunday School today. Be sure to check back next week to see what happens next!